This sanatorium for motorially disturbed children is Oud's most expressive design, consisting as it does of discrete volumes in a wooded setting, each with a distinct function. Patients' pavilions on two sides of a central axis are turned to face the sun. The ten identical pavilions house six boys and six girls apiece. Along the central axis are the headquarters, an L-shaped sports block of gymnasium and swimming pool topped off with an observation tower, and a circular boilerhouse and porter's lodge (the hub of the complex in every sense) sporting a conical aluminium cap. A projected chapel was never built. Oud's search for a poetic functionalism led sometimes to a form of Expressionism gained at the expense of the project's efficiency. 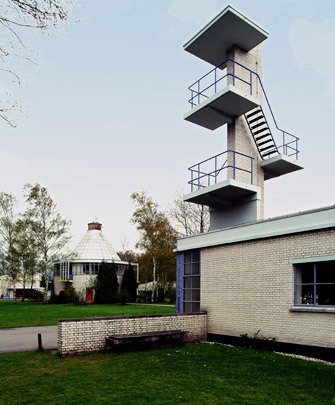 The graphic architecture, with more than a nod to that of De Stijl, is echoed in Karel Appel's tiled artwork above the main entrance.